So, you just began a fitness routine and you want to know how much protein you need. Will a protein powder even do all the awesome stuff you’d heard about? The answer? Yes. Other than protein-rich foods, protein powder is an easy and affordable solution to make sure you’re taking in enough protein for muscle health. Combined with lots of water, protein is the most important supplement you need to add to your diet if you want to build muscle and keep yourself healthy. As you exercise your muscles will be broken down and built back up. But they won’t build back up without protein. With increased exercise, especially lifting, you’ll need to add a lot more protein to support your muscles. This might be hard to track if you only depend on what foods you eat. With protein powder, you’ll always know how much protein you’re getting because each serving contains the same amount. So, what happens when you don’t add enough protein? If you eat less protein than needed, your body will go into a catabolic state and you’ll lose muscle mass. Though you may be eating lots of fish, meat, and nuts, it’s hard to know if you have the numbers just right to balance out the amount of exercise you’re doing. The ultimate goal is to stay in an anabolic state, building muscle. Just like astronauts have to supplement their protein in the weightless gravity, you need to supplement your protein as you work out. Protein, made of amino acids, builds muscle. It also maintains, repairs, and strengthens muscles. Whey protein is the highest recommended protein for new lifters and experienced lifters, alike. It’s the highest quality and can be found in 100% egg, milk, and casein products. If you want to add carbs, vitamins, and minerals to your diet, you may want to consider a meal replacement powder. This is expensive and might not be needed if you search the best whey protein powders. There are protein powders on the market that include vitamins and minerals to support your nutrition. Some provide 50% of your recommended daily intake. The basic number is 1 gram of protein per pound of body weight. This number will change as your routine progresses. The internet has many protein calculators that will do the heavy lifting for you. ;). When you first wake you should fill up on protein and carbohydrates. Over the night you’ve been fasting for 6 to 12 hours and your body has been pretty much lying in one spot. So, each day you began in a catabolic state, having lost muscle mass. Eating protein will get your muscles ready for the day. After scheduling 5 to 6 meals per day you should divide your protein evenly between these meals. Look up charts online that show the average amount of protein in foods. An hour before you train, eat lots of protein and fruit. When your training ends, grab a similar meal, including 40 to 60 grams of protein and an equal amount of carbs. Before bed, eat some protein. Or make a whey protein drink, or smoothie, to fuel your muscles during sleep. Just like your body feeds off your fat when you don’t eat enough, it will also feed off your muscle tissue if there isn’t enough protein available to support your system. In addition to the protein powder, you can also add protein bars if you skip a meal during the day or think you may need more protein. It’s best to keep track of how much protein you’re consuming. And yes, there’s an app for that. To maximize your routine make sure you don’t overtrain. If you’re doing 6 days a week for more than an hour, that’s way too much. As a new lifter, it’s best to train for three days a week using basic exercises and limited sets. Know that you can’t turn fat into muscle. Or vice versa. These are two different things. But, you can burn fat while building muscle. By eating less and pumping iron, your body will eat your fat because you have a caloric deficit. If you’re on a high-carb diet, you’ll lose a lot of weight and a lot of muscle. Which you don’t want. To build muscle and burn fat, follow a low-carb diet. 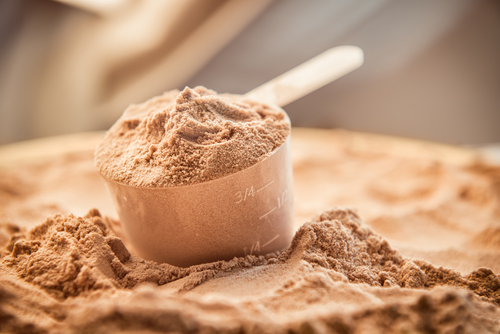 What Are The Most Common Protein Powders? 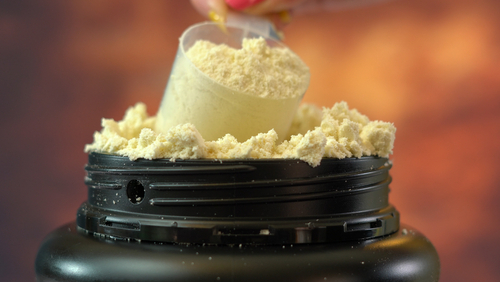 The three most common protein powders are whey, casein, and soy. Whey metabolizes very quickly and is useful before workouts and after. It comes in two variants: whey protein concentrate and whey protein isolate. Isolates are useful when you want lower carbs, less sugar, and high protein. Casein protein powder is excellent if you’re trying to lose weight. Similar to carbs, it keeps you full for many hours, which leads to a smaller caloric intake. Casein can take around six hours to break down. Soy protein powder tends to be the healthiest. It’s able to be used by a lot more people than milk-based casein and whey. If you have allergies, are lactose intolerant, or have other specialized dietary needs, soy is the right choice. A downside to soy is that it doesn’t taste as good or dissolve into water, as easily. Protein powders are a great way to build muscle and keep it strong. Many times the recipe for protein drinks is as easy as filling an 8 oz. glass with water or milk and stirring in one scoop, or serving, until smooth. Make sure to read all the instructions on the packaging and consult forums and reviews before buying protein powders. High-quality powders are very important to your routine. Don’t settle for anything low-quality. It won’t support your fitness goals. Talk to your doctor if you have questions or any conditions that may be affected by ingredients in protein powders. Previous ArticleWhat Effects Does Sodium Have on the Body? How Does Sodium Affect Weight Gain? Next ArticleThe Benefits of Grip Strength-How Does it Affect Your Gains?